Taylored Expressions September Sneak Peeks: Party Pals and Wishes on a Wire-Birthday! Hello! This is a special month at Taylored Expressions because we are celebrating TE's 7th Birthday!!! 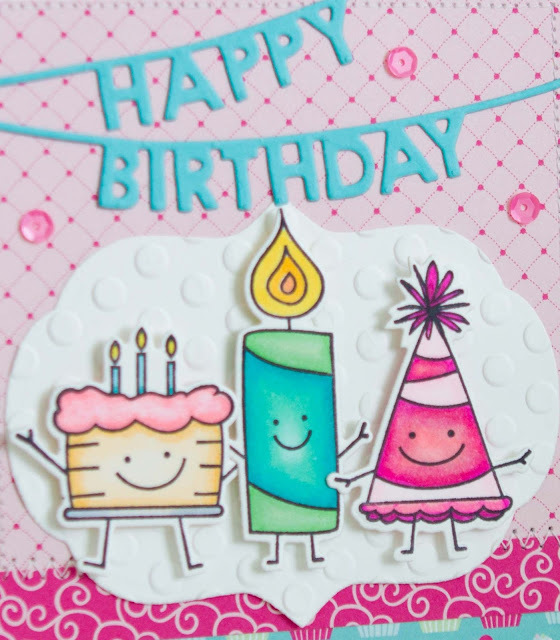 We have several birthday themed products being released this week, as well as some other fabulous new products. All of the new items will be available on Thursday, September 3rd at 7AM PST! For my first card today, I used an adorable and fun new set called Party Pals with Coordinating Dies! I used all 3 images in this set, stamped them with Memento Tuxedo Black Ink, colored with Copics and cut them out with the included dies. 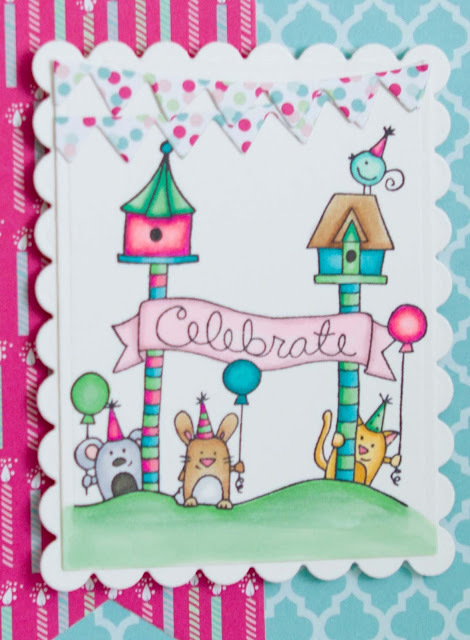 I popped them up with foam tape over a panel cut with a Label Stacklets 1 Die and embossed with the Lots of Dots Embossing Folder. 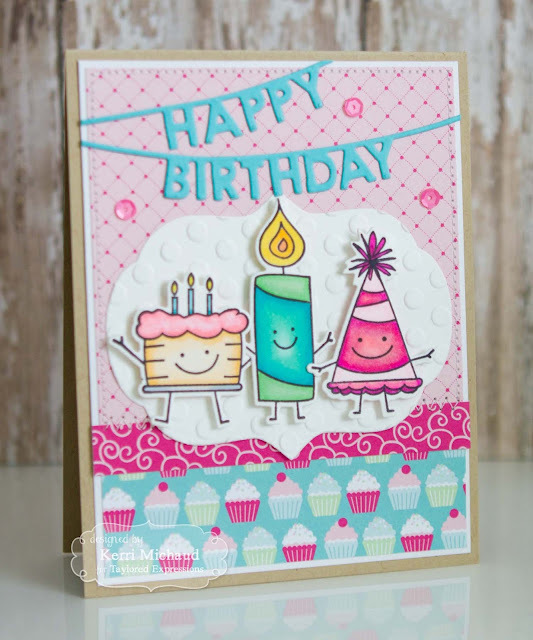 The dp is a really fun new paper pack called Hello Happiness and I added the sentiment with the new Happy Birthday Banner Dies. Finally, I added some fun Hello Happiness Sequins, and some stitching and it was complete! This set would make anyone smile! 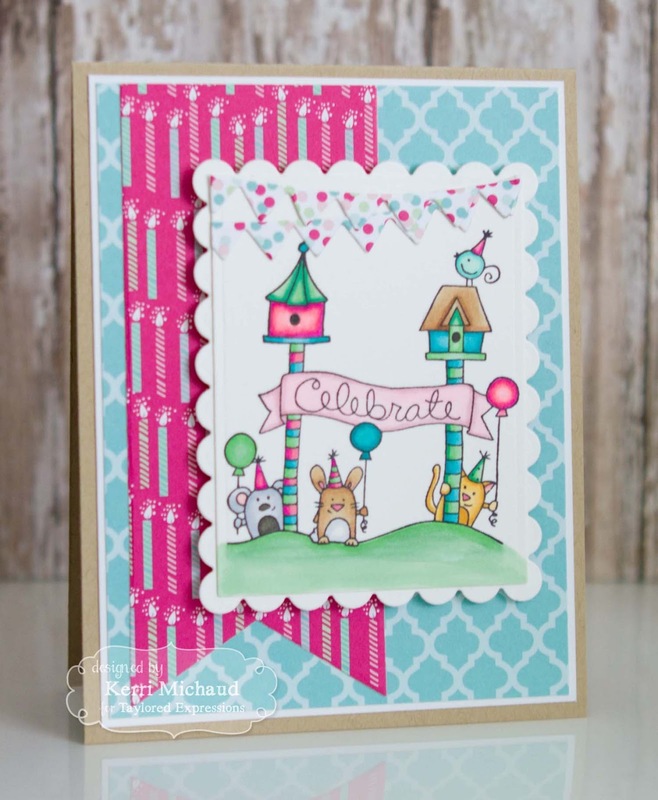 For my next card I used the adorable new stamp Wishes on a Wire-Birthday! I stamped the image with Memento Tuxedo Black, and colored with Copics. I used more Hello Happiness dp and added the cute banner to the top of the image using the new Skinny Mini Party Border Dies. The fishtail was cut with a Banner Stacklets 1 Die. Love both of your cards, they are such Happy cards. Pretty. Looks like you spent a lot of time on these cards. Terrific job! Beautiful cards - love the stamp on the second one!